DIY Headset Lets You Echolocate « Adafruit Industries – Makers, hackers, artists, designers and engineers! This is pretty cool and soon we can all be like Bailey. Dolphins, along with at least 65 species of toothed whales, use the acoustic fat in their bulbous heads to translate clicks bouncing off objects in the ocean into meaningful spatial awareness. They “hear” with their jaws, which contain the same kind of fat that’s in their heads. 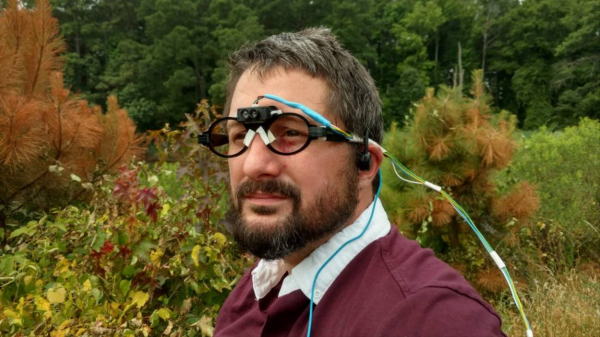 Marine scientist Andrew Thaler built a headset that lets you “see” the way dolphins navigate underwater: Not through your eyeballs, or by listening with your eardrums, but with faux-echolocation and bone conduction.